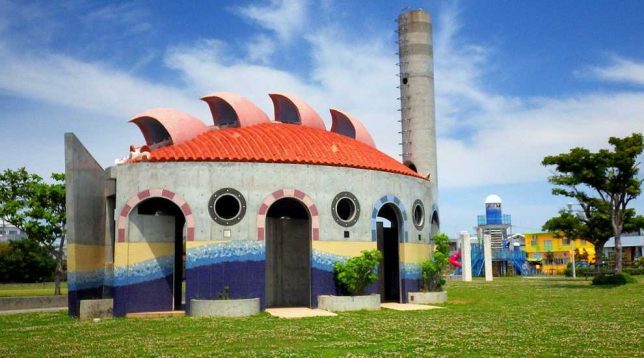 We all want to be smiling when we go but if you’re “going” at one of Okinawa, Japan’s cute and creative public restrooms, grinning comes with the territory. Flickr member Okinawa Soba (Rob) has a thing for public restrooms – not that there’s anything wrong with that – and he also has a camera. The combination is unexpectedly serendipitous, though the photographer deserves full credit for employing the latter with great discretion when exploring the former. 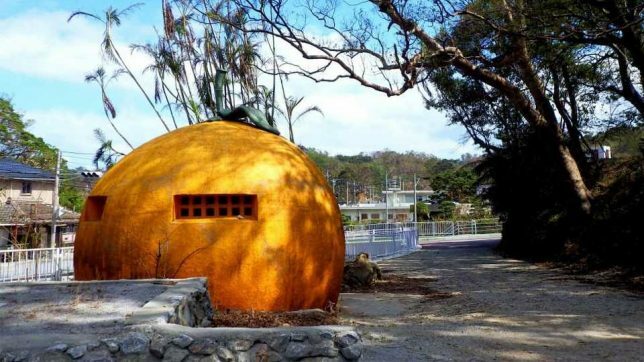 Based in Okinawa, a southern Japanese island prefecture rich in culture, history and tragedy, the photographer snapped most of his posted public restroom shots over the past decade. 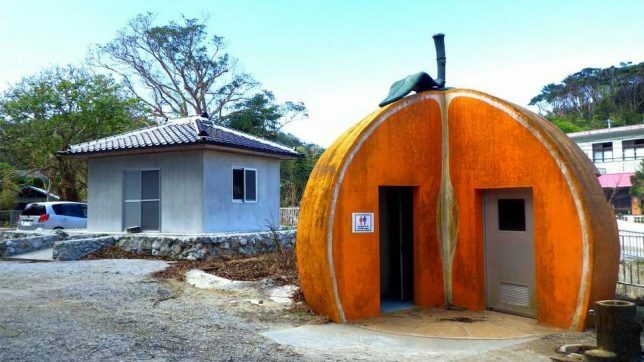 Take the so-called “Tangerine Toilet”, photographed in late 2015 and located in the mountain village of Izumi. 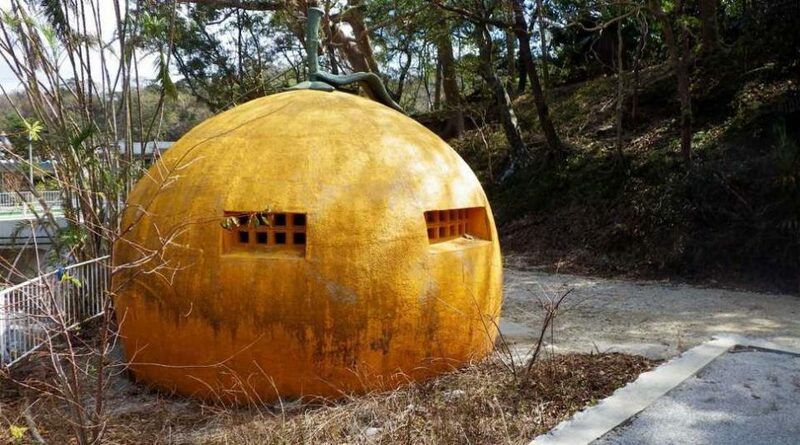 Some say the restroom is modeled after a pumpkin but unlike our familiar Halloween jack o’lantern squash, Japanese “kabocha” pumpkins are only orange on the inside. That’s NOT water under the bridge – it just sounds like it. 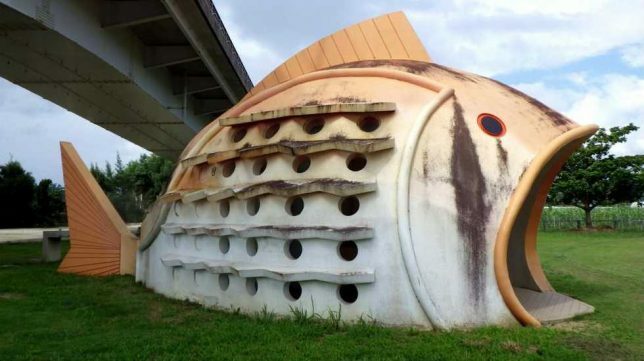 This decidedly fishy public toilet is located in Nago, a city of just over 60,000 in northern Okinawa. 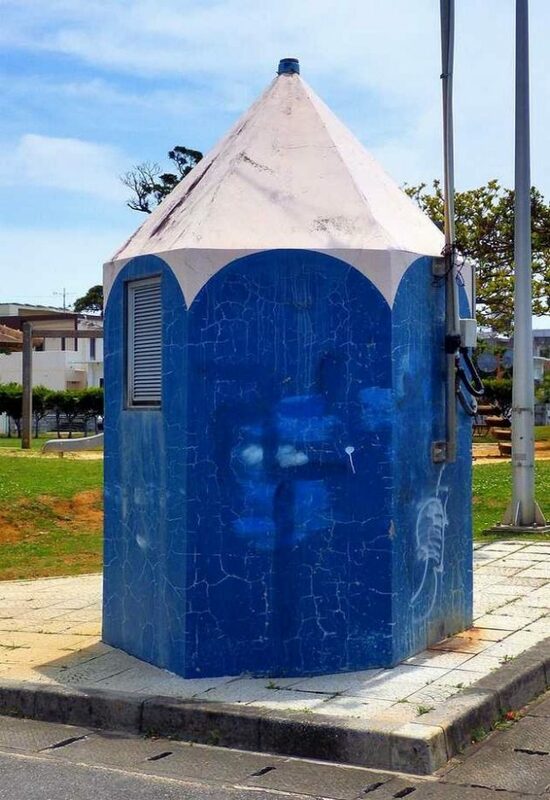 Like many of the island’s mimetic public restrooms, this koi-shaped toilet appears rather sun-faded and soot-streaked, indicating appreciable age. Like most of Japan’s public restrooms in general, however, it’s well-maintained and surprisingly clean on the inside. 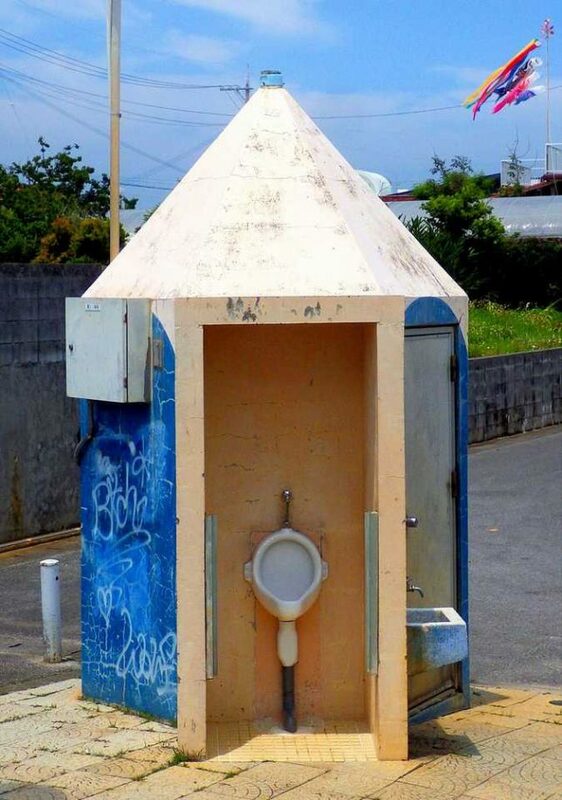 Situated near a small park in Okinawa City, this pencil-stub-shaped public restroom reflects some of the cultural norms of the island in that the urinal is doorless while the toilet (an old-fashioned “squat” model) lies behind a stout metal door. 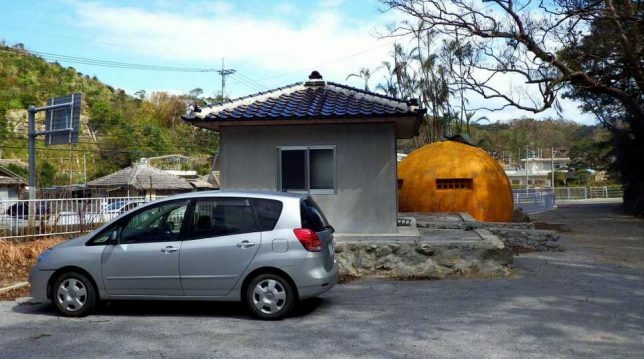 Photographer Okinawa Soba (Rob) snapped the literary loo in April of 2015. 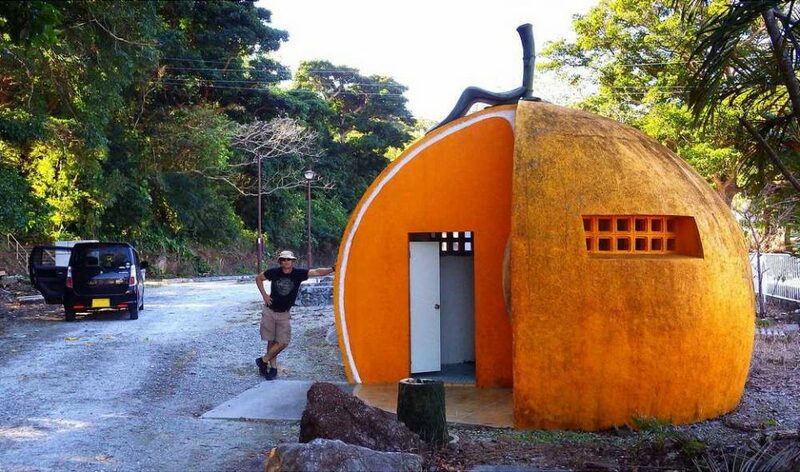 This gorgeous public restroom located in Okinawa’s Awase district is THE place to pee, er, be if you’re in the neighborhood and hear nature’s call. Heck, we’d visit it whether nature’s calling or not! Designed with color-coded entrance ways for each gender, this bright and beautiful public toilet features both traditional and modern commodes to suit any preference.